I’ve participated in National Novel Writing Month every year now since 2009. I’ve found that each year I learned something new. This year was no exception. This year also taught me that there is a HUGE lesson that I still need to learn if I’m ever going to write something worth publishing. 2009: I can sit down and organically write 50,000 words of fiction if I want to. Before that I didn’t think I could. Unfortunately, writing this way results in a meandering, boring bit of prose. 2010: If I brainstorm in advance, and have a decent picture of where I want the story and characters to go, I can hit the 50,000 word goal more easily and produce something with a bit of a story to it. 2011: Brainstorming down to the individual scene level makes writing a breeze for me, but if I go into too much detail I risk feeling like I’ve already written the story before I start. That can be very de-motivating. 2009-2011: I have an extreme tendency to avoid putting my characters into conflict, which results in fiction that isn’t interesting. Even my characters tend to side-step conflict that I do include, because it’s out of character for them or they’re too smart to have gotten involved in the first place. As the chart shows, I wrote nothing on days 1 and 2. I only had the vaguest notion of what I wanted the story to be. On the third, I still had no idea but pushed myself to write something, anything. 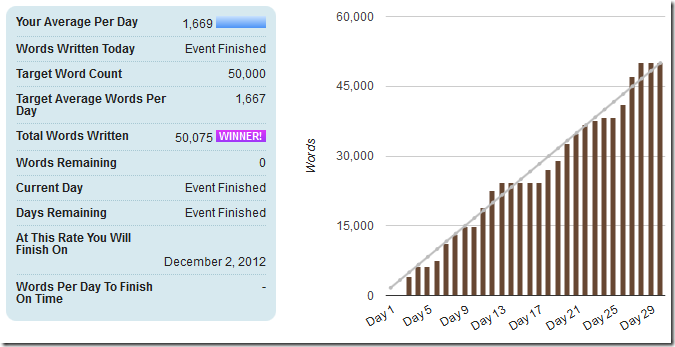 This worked well enough until about the 13th, where at 24,000 words I felt out of ideas. For several days, I wrote absolutely nothing. After a chat with a co-worker and friend near the 18th, I gained a few ideas and got to around 38,000 words over the next few days. Finally, I hit what felt like the steel-reinforced brick-and-mortar lead-lined wall of writer’s block. I pushed myself to write one more scene, hoping it would trigger something. And it did, but not what I expected. This conversation went on for about 7,000 words. Then the character who shot himself returned as a clone of his former self, and went through something similar with me. Suddenly, I found myself at 50,000 words of what was most assuredly fiction. I had completed the challenge! I learned from this experience that I do much better fleshing out a character by having one of these stream of consciousness interviews than I do from any other technique I’ve tried. I will definitely have to do this again for the next novel I write. I’ve also learned that conflict is my biggest problem. If I’m ever going to write a book anyone will enjoy reading, I’ve got to get that issue fixed. Fortunately, I have some good resources on the bookshelf that should help. I’ve also learned that writing flows most easily for me when I get into a meditative trance-like state and let things flow organically. I can see and hear the characters speak, and need only transcribe what they’re saying and doing. But this trance-like state only works to a certain point. If I don’t know the characters well, and don’t know what kinds of challenges I’m planning to throw at them, writer’s block will quickly ensue. Enter that trance-like state and interview my potential characters to learn more about them before I put them in any situations. Using good resources like Story Engineering and Plotting: A Novelist’s Workout Guide, brainstorm at least the major events of the story, getting down to the scene level if I can. Take the time to examine those scenes to see where I can squeeze in additional, relevant conflict for the characters to deal with before they’re written. I think if I can manage to do those three things, my next NaNoWriMo novel (or any work I write) will be much better and get me much closer to publishable.